This Hashbrown and Egg Breakfast Casserole is a no-fail breakfast recipe that everyone loves! To make this hashbrown breakfast casserole, just mix everything together and throw it in the oven! It’s so nice to have a breakfast casserole in the morning that is easy to assemble and all you have to do is throw it in the oven! You can also make this hashbrown breakfast casserole the night before, wake up and stick it in the oven. 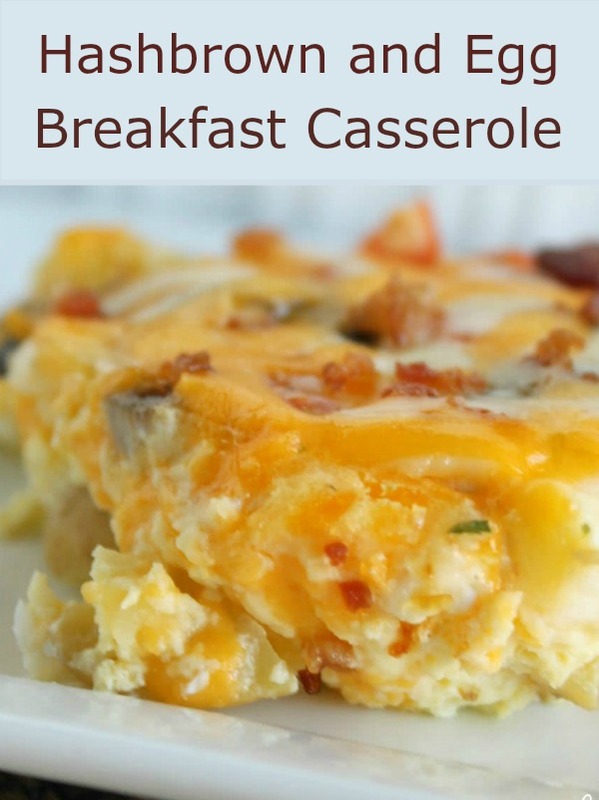 This casserole is great for busy mornings or even can be your Christmas morning tradition! Your house will smell amazing while it’s cooking. We love to use sausage in this casserole. We have tried many different kinds of sausage. We have used ground sausage that we have browned, sausage links, and sausage patties. They all taste great in the breakfast sausage casserole. Whichever one you decide on, just cut the cooked sausage (make sure it’s cooked) into small bite-sized pieces. We have even used maple-flavored sausage to give it a boost of flavor. Another meat option for this breakfast casserole is cooked bacon that has been crumbled. Diced ham is tasty too. Got a meat lover? We have even combined some of the meats for a really tasty and hearty casserole. Crack all of your eggs into a medium sized mixing bowl. Add in the milk and whisk together well. Set aside. In another larger bowl combine the cooked sausage, peppers, broccoli, onion, tomato, hash browns, cheese, salt, and pepper. Add the beaten egg mixture into the veggies. Gently stir together and pour into a greased 9 x 13 pan and bake for 45-55 minutes or until set. When making this breakfast casserole, the hashbrowns are just partially thawed from sitting on the counter while we chopped the vegetables. This makes them thawed just enough that we could break them apart instead of being a frozen clump of hashbrowns. This recipe can easily be prepared the night before and then kept in the fridge until morning. All that you have to do is wake up and stick it in the oven. If you make it the night before, your hashbrowns would thaw in the fridge overnight. Frozen or thawed will work just fine – the main thing is that you watch while it cooks to make sure the eggs are cooked through and the breakfast casserole is set. Mixing bowl set:We really like this mixing bowl set. The 3 sizes make it perfect for different steps in the recipe. Very budget friendly and you get 3 bowls. High Temp Meat Chopper:This is our go-to kitchen gadget when browning any type of ground meat. You can easily break up the meat into the size you want it with this handy tool. 9 x 13 inch glass pan: This pan is a favorite with the handles molded into the glass. We like using the glass pan because we can see how well the casserole is cooked on the sides and bottom. You may have some early risers with these delicious breakfast recipes. In a bowl, beat eggs and milk. Put in greased 9 x 13 inch pan and bake at 350 for 45-55 min or until well set. You could also use bacon or ham in place of the sausage. You can serve this topped with salsa and extra cheese. I make a variation of this recipe, but I add Tennessee Pride Hot sausage (I pre cook it) and mince a small onion-Its requested all this time for morning company. love it! Yummy and EASY! Love it! Yes! Then you just wake up and pop it in the oven! This looks yum! Do the hash-browns need to be thawed? Thaw them just slightly and that will help with mixing! Hi Susan. This recipe can be tripled. But we have never made it in an industrial sized baking pan/dish. We made it in a 9 x 13, so you would need to be sure your baking pan is as deep as the 9 x 13. Having the pan that big, you may need to add a little more cooking time. Be sure it's cooked all the way through and not jiggly in the middle. You could always make 3 9x13 pans of this! It can be prepared the night before and then cooked in the morning. Hello :) Can I cook this in a 8X8 pan and if so what do I put the temperature too? This would be too much for an 8 x 8 pan. You could cut the recipe in half. Cook for about the same time. Watch it closely because it may not take as long to cook. Hi! This recipe looks really good and I'm going to make it today but I had a question about the sausage. Do I took it before I put it into the oven? Thank you! Yes, cook the sausage first. We want to make 4 pans ahead and freeze it, will it be good if frozen before it is baked? Or would it be best baked first? You should be able to assemble the recipe and place in a freezer container. Thaw in the fridge and then bake as directed. Can I brown the hashbrowns first (so they can be a little crispy) and then mix in with other ingredients? I know the hash-browns would need to be cool off before I mix with other ingredients. I love crispy hashbrowns! You can brown them first if you like them brown and a little crispy! Making this recipe for a huge family event tomorrow. Need clarification, do need 12 or 24 eggs? 1 cup or 2 of milk? I know it says 12 eggs and 1 cup two places..is that a typo? Help please!! thanks! We are sorry we didn't see this over the weekend. Thanks for catching that typo. Hopefully you figured it out. The recipe has been corrected now. Frozen hashbrowns you buy at the store are just partially cooked (blanched). So you may want to partially cook your homemade hashbrowns or add extra cooking time to the recipe, but be sure the other ingredients don't overcook. Can I assemble it all the afternoon before the morning of? I work evenings so I am hoping to do all the prep work and assembly before I go into work. Could I cook this the night before and then warm it in the oven the next morning? Trying to make for a large crowd after a baptism.